Apparently I missed the stop for the Holes train when I was younger, because it feels as though everyone else has read this book except for me. After countless people recommended it to me (both through blogging and in my everyday life), I finally decided to listen to the audio book version this summer. While the many positive reviews I’d heard prior to reading this book certainly pushed me to actually start it, I think they may have ultimately done me a disservice. 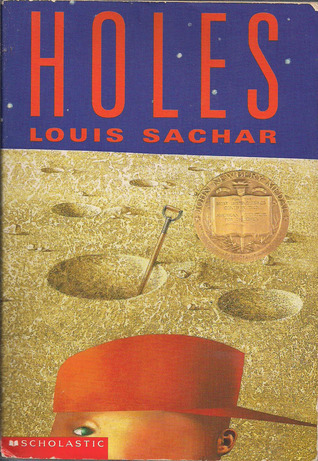 I enjoyed Louis Sachar’s Holes, but finished it feeling a bit disappointed that it hadn’t met my high expectations. One aspect of this novel I did love was how Sachar included clever, funny details in the story. Making the main character’s name a palindrome (Stanley Yelnats) is not only brilliant– it’s hilarious! His unusual name came up several times throughout the story and even played an important part in the climax of the novel. Each detail is significant in its own way, which I greatly appreciated. Similarly, Sachar’s use of repetition led to many little coincidences that were always a satisfying, pleasant surprise to come across. For example, I loved the cyclical nature of the song passed down through Stanley’s family, as well as the ongoing joke about Stanley’s “no-good-dirty-rotten-pig-stealing-great-great-grandfather.” These quirky details added an extra layer of fun, surprise, and wit to an already unique story. Moreover, another strength of Holes is its many complex, multidimensional, one-of-a-kind characters. It’s difficult to pick a favorite, so instead I’ll pick three: Stanley Yelnats, Mr. Pendanski, and the Warden. I couldn’t help but root for Stanley throughout this novel because he is easy to relate with. He’s an average kid who is thrust into an undesirable situation, which is a feeling I think we have all experienced to a certain extent. Life isn’t always easy for Stanley, but he remains optimistic all the same and refuses to give up. What more can you want from a protagonist? The other two characters may not have the most sound morals, but they do have their charms. Mr. Pendanski has an odd sense of humor that I think is hilarious, and I love the way he tries to teach the boys that they are in control of their own lives. He is that ambiguous blend of good and evil which is sure to result in a fascinating character. The Warden, on the other hand, is just plain evil– but that’s what I love about her! Her unpredictability, mischievous personality, and enigmatic persona add an exciting element of suspense to the story. Furthermore, nearly all of the characters undergo some sort of character development. From the courageous campers to the wicked workers of Camp Green Lake, everyone learns a lesson or two throughout this wacky adventure. However, my mixed feelings began to develop when the additional story lines were introduced. There are certainly aspects of the intertwining story lines that I thought worked well, such as the way they helped explain the supposed curse on Stanley’s family and the history of Camp Green Lake. They added remarkable depth to the story and came together nicely in a satisfying, clever conclusion. But along with the strengths of the multiple story lines come several weaknesses, including jarring transitions and a bit of general confusion. Perhaps it’s because I listened to the audio book version of Holes, but I found the transitions between the different plot lines to be quite abrupt. At first they were really unexpected and I had no idea how the second one connected with Stanley’s own story, thought that became apparent later on. I understand that it’s meant to be a mystery or puzzle in the beginning, but I think more could have been done to clarify what was actually going on. Again, this might simply be a result of the audio book, but it’s nevertheless worth thinking about. Holes was also a bit confusing due to the incredibly random nature of the story itself. Kids forced to dig holes exactly five feet deep all around? Carrying a pig up a mountain so it can drink from a stream and miraculously grow larger? Magical onions? Although I fully support creativity and originality, this book was so outlandish at times that it all felt a bit much. Perhaps I would have enjoyed these seemingly random elements more if I had read this book when I was younger. 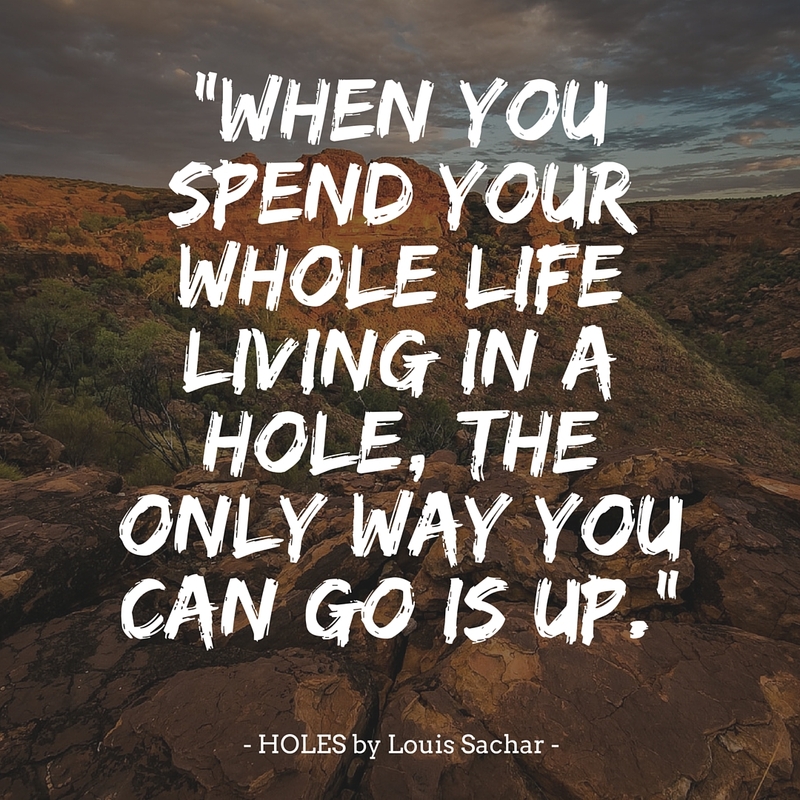 Overall, Holes by Louis Sachar is a unique, clever, and hilarious read. While I enjoyed many aspects of the story– the quirky details, the characters, the satisfying ending, etc.– I couldn’t help but ultimately feel disappointed. This book was so hyped up for me that my expectations grew to unreachable heights, as will happen when the hype monster attacks. Nevertheless, Holes is an entertaining, original, and worthwhile read. Would I recommend it to a friend? : Yes! Despite my own disappointment, I still enjoyed this story very much. Have you read Holes? What are your thoughts on it? Have you ever been disappointed by a book because your initial expectations were too high? Let me know in the comments section below! I read it earlier this year,and promptly passed it to my son because I knew he’d love it! I was familiar with Sachar’s Wayside School books, so I expected Holes to be weird and over the top. The initial introduction of the teacher’s storyline is a little jarring, but I listened to the audiobook too, so maybe it’s better in print (different font or something). “Weird and over the top” is a perfect description! 🙂 I think I might try rereading it in print at some point. I don’t know what it is about audiobooks, but sometimes they just don’t click right with me. I *love* audiobooks generally, but when there are alternating POVs or storylines the producers need to be careful to make it clear. treasure got into the desert, the history of the camp, etc. without thinking about it until the end. I mean he couldn’t out and say “Camp Green Lake was established by the warden so that she wouldn’t have to dig for the treasure that legally belonged to the Yelnats” while the boys were digging holes. Good point! I think I will try to reread it in print eventually, because sometimes audiobooks just don’t click right with me. The format of a book can make all the difference! I cannot help but giggle reading this. I did a review on Radio Disney for holes in fourth grade- oh my word that is so embarrassing to admit, but this post just threw me back! I did looove the book though and now I’m having the itch to read it again. Haha. Thanks for sharing, Holly! OMG that’s awesome!! What a great early memory to have with a book haha 🙂 I’m so glad this review makes you want to read it again! I read Holes when I was in fourth grade, and I too found some of the abrupt changes a bit confusing. Although it is really great, and I think reading it from a book physically might help you understand it a bit more. Overall though, it was really amazing and funny to me. Nice review! That often seems to happen, when reading children’s lit- it’s just not the same, when you’re an adult. But I still loved the humor!